But macroeconomic data that cannot be dismissed as “fake news” demonstrate that this economic growth is neither unprecedented nor miraculous. The same goes for manufacturing jobs growth, however welcome it may be. Moreover, recent economic and employment gains have hardly “put America first”, but instead have arguably spurred growth in competing economies. While hardly worthy of a Whitman verse, no federal agency is more seemingly mundane and overlooked than the Export-Import Bank (“EXIM”), which this week will be hosting its fourth consecutive annual conference without having the authority to make loans over $10 million. Similarly mundane and miraculous is the series of events that could finally restore EXIM’s lending authority and save the bank from another lapse in reauthorization. EXIM’s return could still happen in time to help an economy whose recent growth may be undone by the forces that created it and would truly put America first. But there are many barriers to EXIM’s return. According to a senior professional at a major US exporter, “bringing back EXIM would be a miracle.” In considering these challenges, words of a second great American poet, Robert Frost, come to mind. “I have promises to keep and miles to go before I sleep.” As with all stories these days, this one comes full circle and back to the President, who has so far been uncharacteristically shy about urging action that can help save a bank with a mission to help U.S. workers. The President’s characterization of recent growth as an “economic miracle” is reminiscent of previous boom cycles once touted as miracles only to turn awry for reasons that were easily foreseeable. In 1994, Paul Krugman questioned the widely touted Southeast Asian economic miracle in a famous Foreign Affairs article The Myth of Asia's Miracle. Krugman explained that growth was the simple result of investment made in the region. As every student of Macroeconomics knows, Gross National Product (“GNP”) is the sum of Consumption plus Investment (net of increased savings) plus Government spending net of taxes (C+I+G). The only miracle would have been if Asian economies didn’t grow. Much of that investment was imprudently made, and two years later, the Thai Bhat Crisis of July 1997 ushered in a financial crisis that turned 7% annual economic growth in Thailand, Indonesia, and the Philippines into a 10% fall that took these countries five years to crawl out of. That same dynamic is at work in the U.S. now. Recent growth is far from unprecedented, as shown below. Real GDP growth during all but the first year of the Obama Administration and the two years of the Trump Administration has averaged just under 2%. In comparison, between 1960 and 2009, real GDP grew at an average rate of over 3%., even including steep declines in growth in 2008 and 2009. Post-2010 growth has coincided with unprecedented increases in deficit spending. The federal debt grew from 60% of GDP to 107% of GDP, nearly double the average from 1960 to 2008, the country’s highest level of debt since around World War II. Applying the same C+I+G logic Krugman applied to the “Asian Miracle” and substituting Government spending for Investment, 2% annual growth is anything but a miracle. Starting in Bush’s last year and continuing into the Obama Administration, deficits each year have been higher than any other year since 1960. Following an economic decline not seen since the Great Depression, economic stimulus in 2009 was arguably necessary and though the deficit declined sharply in 2013, deficits have grown steadily since 2016. 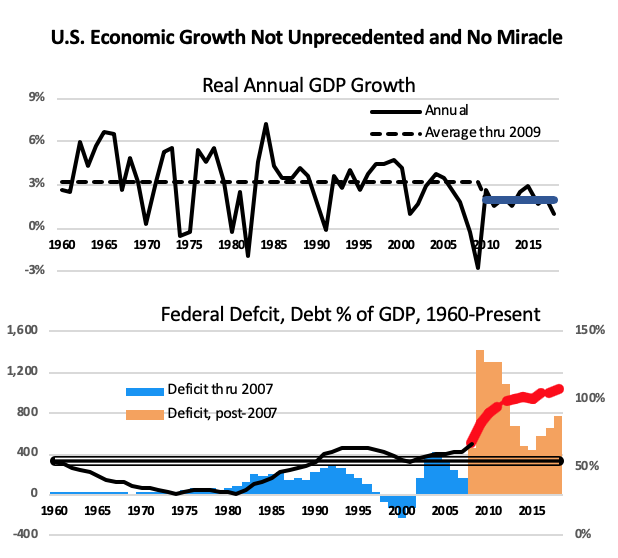 Since 2010, deficits have exceeded nominal GDP growth by 30% - “miracle” GDP growth of less than 2% in 2017 and 2018 would have disappeared without deficits. There is expert consensus that such economic growth borne of deficit spending is unsustainable. Higher deficits lead to higher interest rates, inflation, and use up savings that might have gone to new investment and at the least will be a detriment to long-term growth and could conceivably lead to recession. Exaggerated claims made about employment growth in the President’s SOTU notwithstanding, growth in manufacturing employment last year has indeed been the greatest since 1997. But employment gains and low rates of unemployment are no miracles. They are rather the consequence of increased GDP and deficit spending, following relationships observed fifty years ago by Yale and Brookings Economist Arthur Melvin Okun, whose famous Okun’s Law observed a relationship between unemployment and losses in a country's production and consequently, between employment and economic growth – relationships that hold 50 years later. A pick-up in growth—through a stimulus to the demand side of the economy, for instance increased government spending on infrastructure—will result in more jobs. As has always been true, the relationship between economic growth and job creation among countries has never been uniform, as is shown below. Since 1996, employment growth in the U.S. has generally followed that of other countries and has been within a 60% band of growth rates of competing economies, a sharp dive in U.S. manufacturing employment in 2008 and 2009 notwithstanding. Employment in and outside the U.S. have both followed global economic patterns. Through much of this decade manufacturing and total employment growth in the U.S. have exceeded that in other countries. Until, that is, around 2016. Contrary to claims of by Council of Economic Advisers Chairman Kevin Hassett that the administration has prioritized bringing factories back to the U.S. and the economy has “snapped out’’ of the less robust growth, between 2016 and 2018, U.S. employment growth, which had been outpacing competitors, has been at the lower end of the range of global growth rates. These recent trends have been enhanced by the 2017 corporate tax cuts that large multinational companies earn by repatriating money to the U.S. that is not tied to U.S. manufacturing. As noted in the Atlantic Monthly, American multinational corporations (which make almost half of their revenue from overseas) are enjoying a rare moment of nearly universal worldwide growth. In contrast to recent U.S. economic and jobs growth, which has been widely touted, is neither unprecedented, miraculous, nor even sustainable and has not put America first, a revival of EXIM would be the outcome of obscure and mundane events which have attracted virtually no press. No such agency has ever been so effectively curtailed for so long and its renaissance would be a miracle without precedence. Most importantly, bringing back EXIM would mark the return of a self-sustaining engine for sustainable jobs growth and would most definitely put America first. There has been little or no press coverage of the mundane series of events that now make the revival of EXIM possible, starting with those that left leadership of the Banking sub-committee that oversees EXIM with Senator Crapo (R-UT) rather than Senator Toomey (R-PA), who has been a leader in the cause to eliminate the bank and has placed holds on nominations to EXIM’s Board and who would likely have chosen not to report out a bill for reauthorization. Senator Crapo has voted against EXIM, but has not thwarted EXIM Board nominations or the EXIM authorization process and would on this basis allow the authorization process to proceed. If EXIM can be saved, the resulting growth in employment would be – unlike recent economic and jobs growth – sustainable and 100% American. When at full capacity, EXIM has sent money to the U.S. Treasury – $4 billion during the eight years of the Obama Administration – a small dent in the trillions of dollars of deficit spending but a step in the right direction. More importantly, EXIM benefits U.S. jobs. 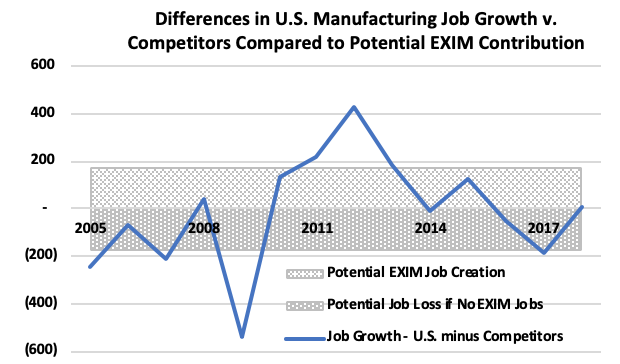 Unlike corporate tax cuts which have been used to fuel economic and jobs growth in competing counties, EXIM’s finance is tied to U.S. content and U.S. jobs, predominantly in the manufacturing sector, where employment as a percent of the total labor force remains at historically low levels. As shown below, differences in employment growth rates (higher or lower) between the U.S. and its competitors is typically equivalent to about 150,000 manufacturing jobs, which is not much greater than the average annual job creation of the bank from 2005 – or the jobs lost by crippling its export credit agency, an asset all other competing nations can rely on. Seen in this light, it is no coincidence that the U.S. out-performed competitors after 2010 when EXIM bank’s activity surged and has generally fallen behind competitors since 2015 when EXIM lost the ability to make loans over $10 million. Despite EXIM’s economic contributions, bipartisan support in Congress and the stated support of the President, there are certainly “many miles to go” before anyone can sleep on any EXIM renaissance. Putting EXIM back together again may not be equivalent to the Sisyphean task of putting Humpty Dumpty back together again, but realistically speaking, addressing the bank’s three key problems will take years. The award-winning Structured Finance Division has gone through at least four leadership changes and with a few exceptions lacks senior personnel. The Transportation Division which was the world’s largest financier of commercial aircraft has lost valuable personnel and its financing is measured in increments of $10 million rather than billions. The bank has undergone yet another organizational change that – if history is prologue – will be redone in a few years. Restoring all the lost expertise and experience can only start once the bank regains authority to finance large deals. As noted last October, to protect the bank and address the issues that made it vulnerable to will require such means as preventing a single House or Senate member from denying EXIM a floor vote; allowing the bank to authorize deals over $10 million with a single Board member; and enhancing its political relevance by allowing it to finance foreign content just like every other ECA in the world. The House version of an EXIM reauthorization might include a few such changes, but won’t change foreign content rules dear to key Democratic constituencies. The Senate version will likely contain no such changes and to get signed into law, the bill may need to get pared down. In fact, even those exporters and EXIM officials who think EXIM’s reauthorization will pass believe it will need to be coupled with another piece of legislation to clear traps that opponents will place in the bank’s way. If a bill could include a rule change to ease requirements for a Board quorum, that would be a victory. Last October JLS Capital wrote that, to have any chance against the multi-billion dollar Koch interest groups who have opposed the bank, EXIM must expand its active political constituency from the corporate interests who, even though they do not receive loans from EXIM, are vulnerable to attack, to labor groups and those focused on working class citizens whose products and services form the basis of EXIM support, including the Bernie Sanders of the world who have opposed the bank. While the change to Democratic leadership in the House has improved EXIM’s political environment, its active political constituency has become smaller. The Council for Employment through Exports – historically the lead group supporting EXIM – ceased to exist last year, leaving groups such as the National Association of Manufacturers and the Nuclear Energy Institute to take up the charge. Companies such as Boeing, Bechtel, and GE remain active, but GE and others have responded to an impaired EXIM by moving jobs overseas and Caterpillar and others have all but disappeared as supporters. There is no evidence of any development of the broad political constituency that the bank needs in the current political climate. As anyone who has ever taken a hike or even a walk across town knows, the only way to “go miles before one sleeps” is to take the first step. That first step and the only step that can be done now is to get a Board quorum and allow EXIM to begin financing large deals again. One person can make this happen – President Trump. While famously not a walker, he can rely on his well-exercised Twitter muscles. <— But there is no guarantee Senator McConnell will deign to set aside time for a cloture vote. While the former Board member did not identify who might bring such pressure, given that exporters have already been applying as much pressure as they can, the obvious point of influence is the President, but that leads to another step up and step back. <— But has remained uncharacteristically quiet on the EXIM confirmations. On numerous occasions, the President has professed support for the bank, but a President who is not shy about tweeting his concerns about almost everything has so far done little or nothing to pressure Senate leaders to take action to overcome holds so the bank could establish a Board quorum and begin to do larger deals. Now that the time requirements to overcome holds will likely fall to a mere eight hours of Senate time, continued silence by the President would be an admission that he doesn’t care about the bank, or by extension, about putting America first. Without a Board quorum and restored lending authority, reauthorization would do little more than to maintain the status quo of a severely constrained bank and it restoring the bank’s capabilities can’t happen. Thus, as with all stories today, the focus is on the President to take the first step and exert his influence so Senator McConnell can respond as he has done before and allow votes to overcome holds on the EXIM Board. Until then, EXIM’s longer journey back cannot start. Seemingly a mundane step, but it seems a miracle for it to happen. Competing economies are predominantly OECD countries that provide reliable employment data. Source for total employment statistics: IMF. Source for manufacturing employment: OECD. Real GDP grew by slightly more than 2% per year under Obama and 1.6%/year in the first two years under Trump. Source for GDP statistics: IMF data.